Did everyone have a good Christmas or whatever? Ours was... a little more complicated than we'd expected. And I'm pretty much run off my feet as a consequence. 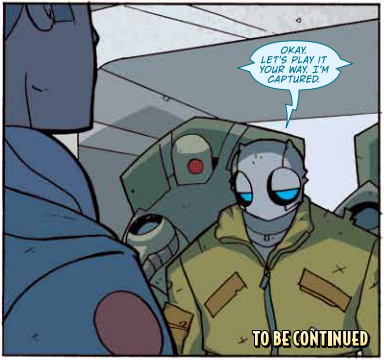 But in celebration of the Fate Core Kickstarter campaign hitting 5,000 backers yesterday, here's a tiny little preview of Atomic Robo: The Roleplaying Game. Specifically, it's an example of how we're using Atomic Robo itself to illustrate some game concepts. In this case, it's conceding a conflict. Robo tries to intimidate Takeshi with an Intimidation total of +4. Takeshi defends with Will and gets a +7—success with style. He gets a boost of Numbers On My Side. Robo changes tack and decides to use Physics to try creating an advantage instead, based on the idea that using ion guns in an enclosed metal environment is an inherently bad idea. The GM decides that this will be an unopposed roll, and it succeeds. Robo creates the aspect Science On My Side. 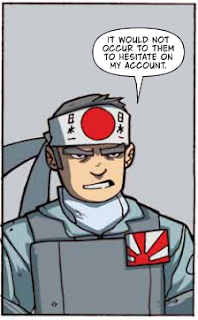 Undeterred, Takeshi goes on the offensive. He rolls Intimidation and gets a +5, and invokes Numbers On My Side to make it +7. He also spends a fate point to invoke his aspect Only Victory and Defeat to bump that up by +2 more, for a +9. Then, in a gutsy move, he spends another fate point to invoke Science On My Side for another +2. Takeshi and his men don't care about their own safety. That makes his total +11. Robo doesn't think he can beat that, nor does he want to end up with a consequence from this, so he decides to concede. He loses the conflict, but on his own terms: Takeshi will keep him alive for now, but incapacitated. Robo gets a fate point for the concession. 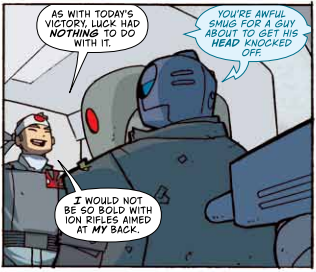 One, this is only one possible interpretation of this conversation -- you could call Takeshi's first line in that first panel as an Intimidation attempt, for example, as well as Robo's rather threatening "It'd kill you too." Or maybe Takeshi's first line is him creating an advantage. They're all valid, and any of them is totally plausible in play. But this is the one I'm going with. 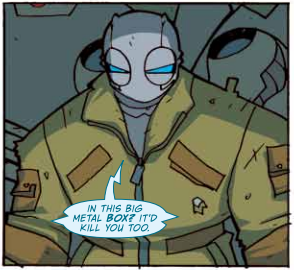 For me, up until the point when Robo literally threatens physical violence, they're just talking, sans dice. But when Takeshi casually insults Robo's piloting skills, Robo's player decides, "All right, it's on." Two, normally in the book, I don't use characters as players, such as "Robo gets a fate point," but in this case I'm prioritizing brevity. These are captions; I don't want them getting too long. I plan to use this technique as often as is feasible in ARRPG. The actual panels from the comic are an amazing resource, and we'd be crazy not to take advantage of them. Hi Mike, Any news on when ARRPG will be out? Nothing's changed on that front -- still shooting for this spring, after the release of Fate Core. The arrival of Baby #2 has certainly had an impact on my free time, in that I never sleep more than a few hours at a time and oh my God what day is it, but yeah. On track. Work continues apace, in those cracks in my life where it can.